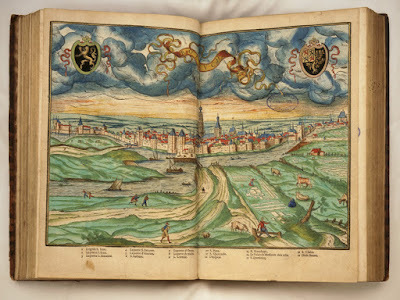 The map below is one of many beautiful and intricate hand-coloured illustrations and maps in Lodovico Guicciardini's book on the Low Countries. Sir George Grey Special Collection's copy is a French edition published in Antwerp in 1567. It was donated to the library by Henry Shaw. The map is of Bolduch ('s-Hertogenbosch or the Duke's Forest) in the southern Netherlands. Iain Sharp notes in Real Gold that Guicciardini's book was one of the best sellers of the sixteenth century. dict la Germanie inferievre, ov, Basse-Allemaigne. Antwerp: Guillaume Silvius, 1567. Sir George Grey Special Collections, Auckland Libraries, 7-C1964. The two main methods for printing maps in the sixteenth century were relief (usually woodcut) and intaglio (copper engraving or etching). The map pictured is a copperplate engraving. The intaglio technique involves engraving lines into a plate of metal. Ink is placed on the surface of the plate, wiped off, but remains in the grooves. Paper is placed on the plate and compressed: transferring the ink from the plate to the paper. One way of distinguishing a copperplate engraving from a woodcut is the indentation of the border of the copperplate itself around the outside of the map. The copperplate engraver's tool, the burin or graver, relied on very little pressure. This made the creation of curved lines far easier than working with wood. Rendering letters on maps was a problem for both wood and copper printing techniques. Creating small lettering was particularly tricky in a woodcut due to the size and shape of woodcutter's knives and chisels. One solution was to combine words in metal type with the woodcut surface as both were in relief form. With copperplate engraving the process was more free-flowing. A cursive italic lettering form was often used. In Guicciardini's map a different approach is taken: a legend or key is used, with places numbered on the map and locations or sites of interest printed in text below. Sir George Grey Special Collections, Auckland Libraries. The Sir George Grey Special Collections copy has notes in Latin about Guicciardini and other editions of his book inserted at the front, with an English translation attached. There are also annotations in the margins in Latin. One of the pieces of marginalia -- a pointing finger symbol, referred to as a manicule, digit or index -- was a popular wayfinding device for hundreds of years. Author: Zoë Colling, Sir George Grey Special Collections.